The oven isn't the only place cook a ham. Prepare it on the grill for a little smoky flavor and a super crisp exterior. 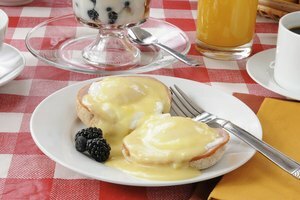 Grill either fresh ham, which is uncooked, or a smoked or cured ham, which typically comes precooked but requires reheating. Use indirect heat for ham, whether you have a charcoal or gas grill, to ensure that the inside is fully cooked or heated through before the outside is finished. 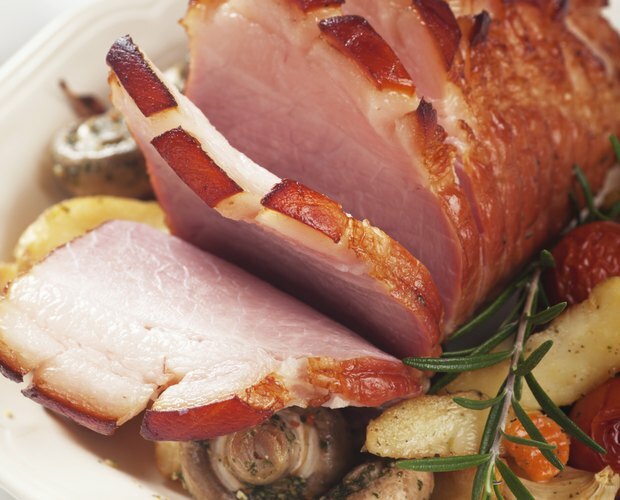 Submerge the fresh ham completely in a large container of brine and store it in the refrigerator for at least 24 hours. Make a basic brine using about 4 tablespoons of salt for every quart of water, or replace some or all of the salt with sugar for a sweeter ham. Remove the ham from the brine and rinse briefly under cold running water. Pat it dry with paper towels. Score the skin of the fresh ham in a diamond pattern, using a sharp chef's knife. Cut all the way through the skin, but not through the meat. Set up your Weber grill for even, indirect heat. For a charcoal grill, place a drip pan filled halfway with water in the center of the grill's bottom, adding charcoal on both sides of the pan. Light the coals to preheat until they are lightly covered in ash. 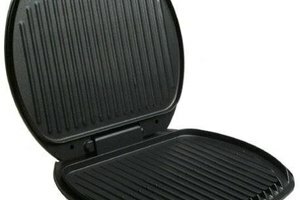 On a gas grill, lift the lid and open the valve on the propane tank, waiting a minute for the gas to travel up the line. Turn all the burners to high and close the lid to preheat for 15 minutes, then turn off one side of the burners and reduce the other side to medium heat. Place the ham, fat side up on the grill, over the drip pan on a charcoal grill or on the unlit side of a gas grill. Close the lid and cook the fresh ham for about 20 minutes per pound. Add fresh coals to the charcoal grill periodically and use the vents to maintain a grill temperature of about 300 to 350 degrees Fahrenheit. Baste the ham every five to 10 minutes during the last 30 minutes of cooking, if you like. Use any type of basting sauce, such as barbecue sauce, honey mustard sauce or melted brown sugar mixed with butter. Remove the ham from the heat when its internal temperature reads at last 145 degrees Fahrenheit in the center using a meat thermometer. Let the ham rest for 20 to 30 minutes before serving. 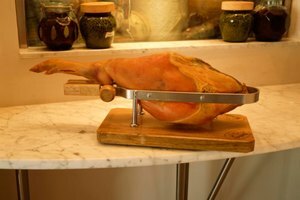 Sit a thawed smoked or cured ham on the counter uncovered to come to room temperature. Allow 30 minutes to an hour before you plan to cook. Prepare your grill for medium-low indirect heat, adding a drip pan to a charcoal grill and placing fresh coals on either side of it. On a gas grill, open the lid, turn all burners on high and close the lid to preheat for 15 minutes. Turn the burners on one side off completely and reduce the burners on the other side to a medium-low temperature, about 325 F.
Score the ham with a sharp chef's knife, creating a diamond pattern on all sides of the ham, except for the cut side. Set the ham with the cut side down into a large foil pan. Pour in 1 to 2 cups of water or a flavoring liquid, such as apple or pineapple juice. Cover the pan loosely with foil and place it on the grill, over the drip pan on the charcoal grill or on the unlit side of the gas grill. Cover and heat for 10 to 15 minutes per pound, until the internal temperature reaches at at least 145 F.
Glaze the ham 10 to 15 minutes before removing it from the oven, removing the foil cover to allow the glaze to caramelize. Remove the ham from the heat and let it rest for 15 to 30 minutes before slicing and serving. Place damp, flavored wood chips on top of the charcoal or in a smoker box of a gas grill to add smoky flavor to your ham. Hickory, oak, apple and mulberry wood chips complement pork well. 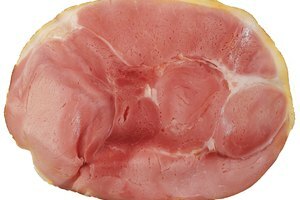 Remove the ham from the heat to rest when it gets within 5 to 10 degrees of 145 F, if you don't want to cook it any further. The temperature will rise another 5 to 10 degrees while resting. The USDA recommends reheating fully cooked hams to 145 F for safe consumption, although Weber recommends cooking it to 120 F to 130 F to avoid drying out the meat. Use your own discretion, keeping safety in mind.